Although it thinks it does. And when, as at present, things appear a little too slow for the government´s wishes, we are quick to blame others. This time it´s the excessively easy monetary policies of advanced economies that is causing a “liquidity tsunami” which brought about an undesirable appreciation of the real – the “currency wars” thing – and hardship for industry in Brazil, reviving talks of deindustrialization and the need for industrial policies. But since there´s no time for developing a set of coherent plans, we slap protectionist measures through taxes, subsidies, exchange controls and even requests for “voluntary export restraints” from some of our major trading partners. But we have been down that route before. So what I´ll do is compare and contrast Brazil with Korea and China over the past 35 years and show how costly it is to adopt protectionist measures. Before doing that, I´ll like to show that during times when the external environment is extremely favorable we mostly miss “hoping on the fast moving train”. Everyone remembers Lula´s favorite quip: “Never before in the history of this country ‘something’ has been so good”, usually referring to some positive economic aspect. But let´s examine things with care. As will become clear, the “big thing” at the start of the 21st century, was China´s entry in the WTO, thus becoming a “card carrying” member of the “Club of Nations”. Immediately, growth in China accelerated and this “pulled up” many countries. Although Brazil benefited – and that´s the reason why Lula could say the things he said, in fact he was doing the utmost to counteract the pull from Chinese growth. That becomes clear when we look at the chart below which shows the path of industrial production in Asia (heavily weighted by China), in emerging markets in general and in Brazil. That´s what I call a “nonperformance”. 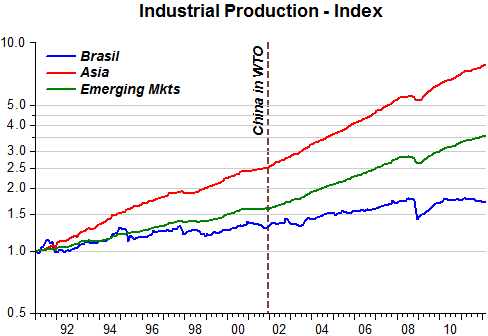 While since China entered the WTO at the end of 2001 Asia´s industrial production went up by a factor of 3.1, emerging markets (includes Brazil) by a factor of 2.1, Brazil´s industrial production increased by a measly 34%! So Mr. Lula, this is what you should have said: “Never before in the history of this country have we failed so completely from taking advantage of an enormously favorable environment”. As seen in the chart above, after recouping it´s pre-crisis level, industrial production is faltering, giving rise to clamors for protectionism. As the saying goes, if you disregard history you´re bound to repeat the mistakes of the past. 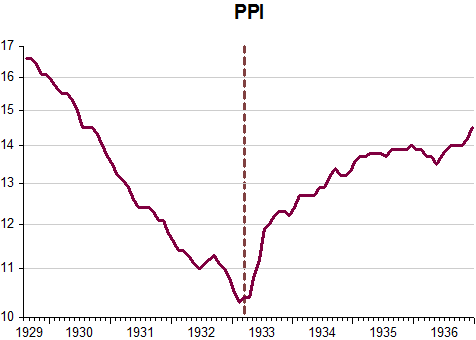 So let´s have an idea how much protectionism in the past has cost us. 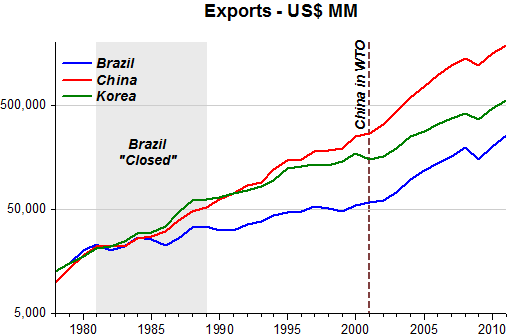 Interestingly, in 1980 the dollar value of Brazil´s exports and imports was almost exactly the same as those of China and Korea. That starting point is interesting because right after that Brazil decided that the best way it could confront the problems associated with its external debt was to close the economy – maybe you remember the “Lei da Informática” – that outright prohibited imports of hardware and software so that Brazil could develop its own tech industry uninhibited by foreign competition. The charts below show what happened to trade in Brazil, China and Korea from that moment. Notice that Chinese trade growth after becoming a member of the WTO increased spectacularly. 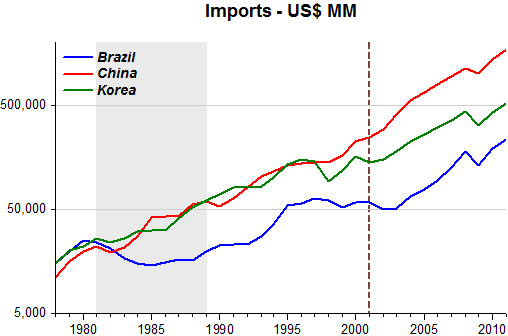 So did Brazil´s trade, since by then we had adopted more free trade policies. Unfortunately, we were late into the game! Worse, now we want out! What did being late into the game cost us and what damage “wanting out” can bring? One measure is to see what happened to total economy output or income per capita. And this story is shocking! Between 1980 and 2001, per capita income in Brazil was stagnant. Coinciding with our increased trade, since 2001 incomes in Brazil increased by almost 30%! Surely, looking at what happened to incomes in both China and Korea over the whole period that cannot be a simple coincidence. 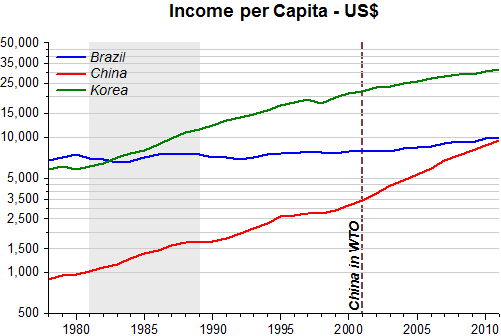 Yes, in 1980 Brazil was slightly richer than Korea and almost 8 times richer than China. But China has caught up and Korea is a little over 3 times richer! Yes, minister, the surest way to impoverish your country is to increase protection. Have your feast! Do news and history always trump fiction? Read an “old” newspaper, from the ancient pre-Internet era of December of 1984: “The Reagan Administration is considering a plan to would place the now autonomous US Federal Reserve under some form of administrative control, The US Treasury Secretary, Don Regan, said yesterday.” That was AP wire copy, and the story went national. Long forgotten today, given the near-hysteria and requisite orthodoxy on the American right that only tight money is sound policy and patriotic, is that the Reagan White House tried to skin Fed Chief Paul Volcker alive back in 1984. And not just Volcker—they wanted to eviscerate the Federal Reserve Board, and shift control of the money supply into the Oval Office. Inflation in 1984 had just dropped under 5 percent, and the Reaganauts wanted the Fed to print a lot more money, and keep the economy flourishing. Secretary Regan mustered more than a few arguments. “The United States is the only country in the world that has a totally independent central bank,” he averred. The Fed was an errant oddball institution, obsessed with fighting inflation instead of promoting growth, the Reaganauts charged. Ergo, Volcker (originally an appointee of President Jimmy Carter) was a loose cannon on the deck of macroeconomic policy making. Some Reagan hagiographers have tried to pooh-pooh Regan’s commentary as not truly part of the Reagan heritage, and cite Reagan’s gentlemanly public statements about Volcker as proof of the pudding. Indeed, “Reagan, The Inflation Fighter” is a subspecies of GOP monographs, written even by people who know better, such as GOP solon and Stanford University academic John Taylor. But the Reaganauts are engaging in Soviet-style revisionism. And, in an early version of the GOP talking-point coordinated attacks, other prominent establishment pundits simultaneously bared fangs at the Fed, including the Wall Street Journal, which also opined that Fed was being too severe. By all accounts, Volcker was an outsider in the Regan White House (he was independent after all) and Regan was an insider. Later, Volcker would recall that the Reagan White House actually did not have a coherent monetary policy in mind—even as they wanted to seize control of the nation’s money supply—and so he was able to sandbag their assault on the Fed. “I saw him (Reagan) from time to time, but I was not a close intimate of President Reagan’s. His entourage in the White House, or certainly in the Treasury, were very critical at times. They were… kind of a funny mixture. They had monetarist doctrine, supply-side doctrine, libertarian doctrine all mixed together, so some of it wasn’t terribly coherent, which helped me a bit,” Volcker told PBS in 2000. Flash forward to 2012. Today inflation is one-half that of 1984, the level the Reaganauts and the WSJ thought was well under control. And the economy is in a much deeper mire perhaps12 percent below trend or potential. Unemployment is persistently high, and about 5 percent of the population has dropped out of the work force. That is, one of 20 people in this country, who were gainfully employed in 2008, may never work again, given the ongoing doldrums. Real estate is underwater coast-to-coast, loans made in nominal dollars. One might expect the President of the United States to breathe fire under such circumstance—a modern-day Don Regan would lay relentless siege on the Fed. Not so. There is no reflection in the not-so-distant mirror. Instead, there is a mysterious silence, indeed a vacuum, from the Obama White House on Fed policy. Tim Geithner is the current Treasury Secretary, almost certainly headed to a career on Wall Street soon. A Google search on Obama and monetary policy turns up almost nothing—Fed policy (our most important macroeconomic policy-making agency) is terra incognito for Obama. With search, one can find the Brazilian president discussing the U.S. Fed policy, but not Obama. Has Team Obama drifted dangerously? One can only conclude so. Unlike the Reaganauts, they did not bring the fight to the Fed, and instead allowed the gold-nuts and Governor Rick Perry to own the issue. Bernanke, who does not inspire awe the way the strong-minded Volcker did, has had to contend to rabid currency worshippers and a rising punditry of inflation-fixated fanatics, such as Dallas Fed President Richard Fisher, without moral support from the White House. Obama’s supine lack of interest in Fed appointments (properly raising the ire of such astute observers as Scott Sumner) nearly constitutes malfeasance in office. And just how koo-koo are today’s self-appointed anti-inflationistas? In 2009, Richard Fisher traveled to Japan, a nation that has endured 15 percent deflation in the last 20 years of checkered recessions—and then lectured them on the evils of inflation, which he equated to “rot” in the economy. Lecturing anorexics on the dangers of fatty foods may come to mind, but the serious point is that Bernanke is moored in a dangerous, even perverted milieu, and badly needs help to make the pro-growth decisions that have to be made. Let us hope that Team Obama wakes up—though it may not matter soon. If GOP contender Mitt Romney wins the White House, most likely the pressure on the Fed will dissipate—indeed, one can anticipate John Taylor as Fed chief, devising a version of the Taylor Rule that calls for steady QE (as he advocated for Japan). “Deficits don’t matter”—a Bush era mantra—may be heard again. Seems likely, no? Like I said, history and news always trumps fiction. You couldn’t make this stuff up. Please don´t miss this wonderfully readable discussion of reasons for the adoption of an NGDP Level Target by Nick Rowe. The GDP release today showed things are even worse than expected, with real growth coming in below expectations. Of course there are those who pretend to find “golden nuggets” inside the entrails of the aggregate number, but mostly it´s wishful thinking. I think we can conclude, by Bernanke’s statement’s in the past and the actual path of inflation now, that Bernanke has embraced the recession as yet another exercise in opportunitistic disinflation in which the Fed can knock another 40bp off the expected rate of inflation. Bernanke is clearly misleading us when he claims the target is symmetric as the Fed’s own projections clearly treat the target as a hard ceiling. Apart from this there´s the question of which price index to use. And inside the Fed there are those who think that, for example, “the core is rotten” (see also here). As I like to say, the inflation obsession (and paranoia) is a formidable barrier to progress. And the obsessive pursuit of an inflation target is a sure way to get the economy to fall into a “bad equilibrium” as it did after mid-2008. Update: Just ran across another take on the “inflation obsession”, only they call it the “2% Catastrophe“. I empirically determined the relative weights central banks put on deviations in real growth and inflation at different times — their “loss functions” — interpreting the consistent discretionary choices of policymakers as NGDP-style rules, with additional weights on real growth or inflation. I further combined the two weights into a single measure which I called an H-value; a positive H signifies a policy which is intolerant of inflation deviations relative to real growth deviations, a negative H signifies the opposite, and an H of zero is an NGDP rate target. Applying this research, my perspective was to rephrase Karl Smith’s question as: Does the Fed’s H-value change at or near the zero lower bound? The answer I got was yes, and the effect is substantial. For every percentage point the nominal federal funds rate falls, the Fed becomes 17 percent more sensitive to deviations in inflation relative to deviations in real output. 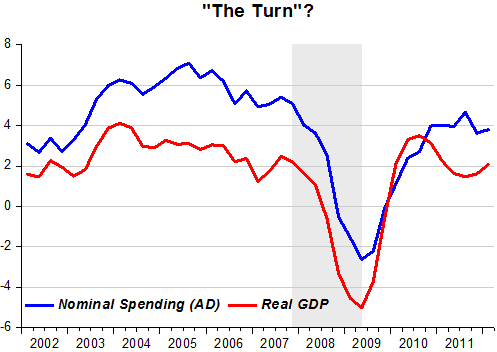 The GDP release and how some seem to be content with what we´ve got. Maybe it is that we´ve lost all sense of “decency”. And he follows that up with what I thought was an enigmatic post called “”The turn illustrated”. I really don´t know if he´s being sarcastic or really thinks “it looks decent” because growth has come up to levels experienced before the crisis. Below a version of his illustration, in which I include the growth of a measure of aggregate demand. The point, as illustrated in the next chart, is that the economy is still languishing deep inside the hole into which it dropped four years ago. What a waste! While the unseasonably warm weather helped the economy by boosting home building and renovations, it undercut demand for utilities, spending at ski resorts and sales of winter apparel. The internals of the first-quarter report are also a bit discouraging. Growth in personal consumption expenditures was pretty good at 2.9%, but private investment growth slowed sharply. Growth in final sales of domestic product, a good measure of underlying demand, came in at an anaemic 1.6% pace. Current-dollar GDP growth was a paltry 3.8% for a second consecutive quarter. The American economy is clearly one in need one of demand. In December of 1984, Donald T. Regan, President Reagan´s Treasury Secretary attacked the Board of the Federal Reserve, accusing it of being “penurious” in restricting the money supply and warned the Treasury was studying ways of restricting the Board´s independence. I wonder, comparing the images below that contrast then and now, how loudly Don Regan would be “shouting” today! Most likely he would have requested the Department of Justice to send FBI special agents to round up all members of the Board under the charge of practicing “domestic terrorism”! Note that I haven´t mentioned Hitler or Nazis, so as not to lose the argument at the outset. But what else does this mean? The general´s Italian, but guess who the CCO is? BILD: President Draghi, when it was clear that you were to become head of the European Central Bank, BILD made a photomontage of you wearing a Prussian spiked helmet and called you a “true German”. What did you think of that? Mario Draghi: I really liked it. The Prussian element is a good symbol of the ECB’s key task: tomaintain price stability and to protect European savers. BILD: Is there a rift between north and south in the Governing Council? Draghi: No, there is no divide between north and south. All members of the Governing Council have taken to heart Germany’s stability culture. The time of conflicts is over. But let me also say that the situation in the autumn was really critical. It could have led to a dangerous credit crunch at the banks and thus to bankruptcies; companies would have suddenly been left sitting high and dry financially. We had to prevent that. BILD: And the banks are doing nicely out of it, right? Draghi: The ECB’s money has got to the right places. In Germany alone, 460 banks participated in the action, many more than usual. So it wasn’t just the acutely suffering banks, but also many others, many of them small. That particularly helps the small and medium-sized companies that account for 70% of all jobs in Europe. BILD: This all sounds very optimistic. Is the euro then a safe currency? BILD: Is the crisis over? BILD: If it were your birthday today, what would you want from the German government and the Chancellor (guessed who the CCO is?)? Draghi: Trust the ECB. Trust Europe. Why don’t we do more? I would reiterate, we’re doing a great deal of policies extraordinarily accommodative. You know all the things we’ve done to try to provide support to the economy. I guess the, uh, the question is, um, does it make sense to actively seek a higher inflation rate in order to, uh, achieve a slightly increased pace of reduction in the unemployment rate? The view of the committee is that that would be very, uh, uh, reckless. We have, uh, we, the Federal Reserve, have spent 30 years building up credibility for low and stable inflation, which has proved extremely valuable, in that we’ve been able to take strong accommodative actions in the last four or five years to support the economy without leading to a, [indiscernible] expectations or destabilization of inflation. To risk that asset, for, what I think would be quite tentative and, uh, perhaps doubtful gains, on the real side would be an unwise thing to do. “Usually problems are hard not because our technique is deficient but because our understanding is deficient”. 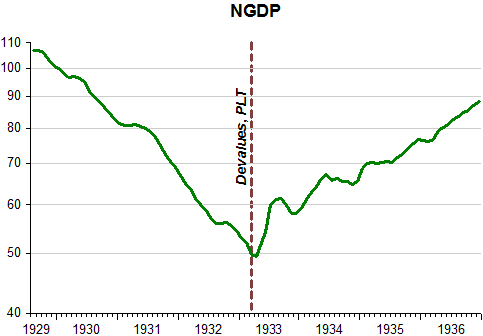 Target the path of nominal GDP, people! And that is uttered by uber Keynesian Brad Delong, a firm believer in the liquidity trap. You know, I thought three-and-a-half years ago that this would work out very differently. I thought three-and-a-half years ago that the Federal Reserve would announce that its mission was primarily to keep economy-wide nominal spending on its pre-2008 growth path, that this was an emergency situation, and as long as economy-wide nominal spending was below its pre-2008 growth path additional accommodation was warranted. Anyone recalls Brad advocating NGDP targeting? Why doesn´t he link to it? After all his blog is one of the oldest on record. Why? Japan was in deflation. We’re not. Yeah, let me tackle that second part first. So there’s this, uh, view circulating that the views I expressed about 15 years ago on the Bank of Japan are somehow inconsistent with our current policies. That is absolutely incorrect. My views and our policies today are completely consistent with the views that I held at that time. I made two points at that time. To the Bank of Japan, the first was that I believe a determined central bank could, and should, work to eliminate deflation, that it’s falling prices. Now looking at the current situation in the United States, we are not in deflation. When deflation became a significant risk in late 2010 or at least a moderate risk in late 2010, we used additional balance sheet tools to return inflation close to the 2% target. 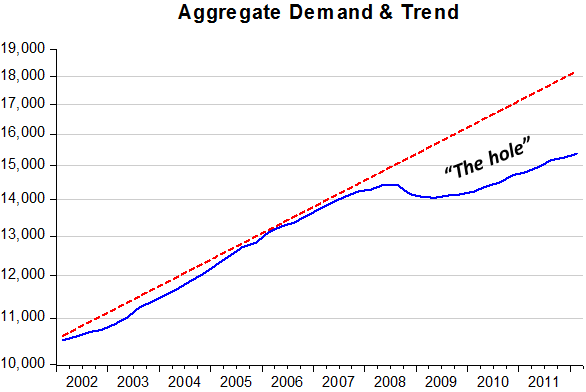 mandate, so to speak, are demanding additional deflation(!). We must reevaluate Bernanke´s supposed knowledge about the power of monetary policy. A reread of his (infamous) “A case of self-induced paralysis” on Japanese MP shows he´s almost exclusively concerned with deflation. “Deflation. Making sure “it” doesn´t happen here” in 2002 just after becoming Fed governor is another pointer to his “deflation phobia”. Bottom line: At the 2% altar a lot is being sacrificed! Update: David Beckworth has a much more “Bernanke friendly” post. The article is well worth reading. Krugman even relaxes his “liquidity trap constraint”. Unfortunately, Krugman is still too tied with monetary policy as interest rates and with the need to increase the inflation target. I think these two “principles” form the greatest barrier for innovative thinking about monetary policy, in particular given the dire economic situation. 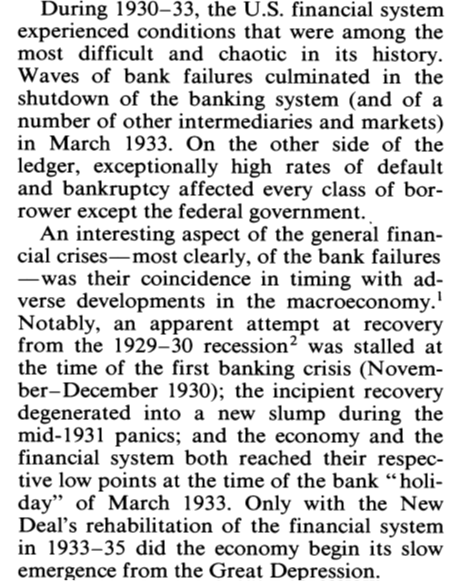 And what Bernanke gets wrong, and the fact that has most influenced his behavior, is that it wasn´t the New Deal´s rehabilitation of the financial system in 1933-35 that got the economy going, but, and in spite of New Deal legislation, it was the monetary policy loosening induced by FDR´s March 1933 decision to delink from gold, devalue the dollar and indicate a price level target that triggered the economic rebound. 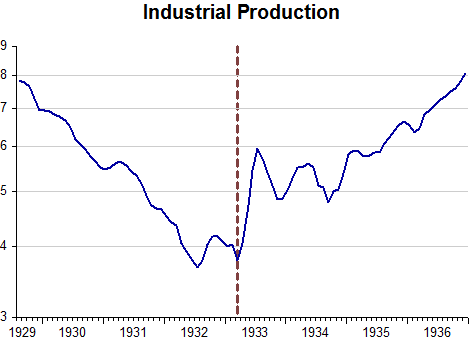 New Deal legislation was only enacted in July 1933, and as the industrial production chart shows it stopped the largest ever rebound in production on it´s track. The figures below illustrate what has been dubbed “Rooseveltian Resolve”. Most striking is the apparent unwillingness of the monetary authorities to experiment, to try anything that isn’t absolutely guaranteed to work. Perhaps it’s time for some Rooseveltian resolve in Japan. Update: Just saw that David Beckworth also discusses the Krugman article.